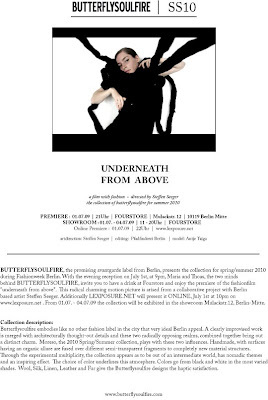 Spring/Summer 2010 "UNDERNEATH FROM ABOVE"
"Berlin-based Butterflysoulfire http://www.butterflysoulfire.com has always been a label to rebel against traditional silhouettes in a way that gives ready-to-wear an avant-garde flair. For their spring 2010 collection entitled "Underneath From Above", Butterflysoulfire fuses architectural aspirations with handcrafted ornamentation for a range that has a definite direction, all-while progressing organically. Dressed in hues of black and gray, the collection appears dark, when it is actually quite whimsical. Leather, wool and silk might work together to create an edge, but scarves shaped after fairy wings and delicately hand-knitted tanks have another story to tell. The collection and its finely executed silhouettes contrast an alluring softness with a more masculine fit that is over the top, yet refined to a point that it is still accessible. Ultimately, designers Maria Thomas and Thoas Lindner have crafted a collection that blends just the right amount of quirk with beautiful functionality."